AIA New Jersey recently held the State Convention in Whippany, NJ. The two (2) day event featured informative seminars, inspiring keynote speakers and local building tours. The Friday schedule began with keynote speaker, Shirley Blumberg of KPMB Architects, featuring recent work addressing five significant architectural challenges: diversity, inequity, environment, building community and limited financial resources. KPMB Architects are based out of Toronto, Canada. 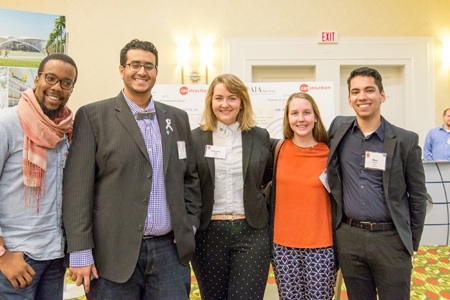 Friday evening was capped with the announcement of winners of this year’s AIA New Jersey Design Awards during a cocktail reception. The winners included students, new firms and, as always, a review of the jurors commentary on the projects. Service Awards and the AIA Newark & Suburban Canstruction Awards were also celebrated. Saturday’s schedule included three keynote speakers. The buoyant Michael Michalowicz, author of The Pumpkin Plan, and numerous other business books, lifted the early morning audience with his comedic story telling interwoven with business enhancement tips. Free copies of his books were given to members at the end of the lecture. Next up, was Obiekwe “Obi” Okolo, Assoc. AIA, and AIAS National Vice President. His evocative speech entitled, “Kanye Architecture, Just West of Insanity” challenged the audience to look at themselves and the profession through lens focusing on the words and ideals the profession uses to promote itself and its members. The post-presentation discussion was easily the most lively of the weekend. The final keynote featured Karen Nichols, AIA of Michael Graves Architecture & Design, and focused less on the work of Michael Graves office and more on the inspirations for the firm and Michael throughout his life. AIA West Jersey encourages all members to attend next year’s conference.